Success in marketing, online or offline for a great part lies in how effectively you visualize your concept. In the past, banners were screaming loud to draw your attention. When television became a major source of entertainment, advertisement took a different form but the golden rule remained the same – to hold the audience’s attention with stunning visuals. Now, the Internet has created a variety of new visual marketing opportunities. Being a visual social networking site, Pinterest gives you a place to pin your images and videos to share them with others. It is a versatile marketing tool and offers a great visual experience, which can be used to drive sales. You can follow and be followed using Pinterest. When your pin is viewed by another Pinterest user, they can follow you, follow the specific pinboard, like it, comment on it and repin it to their pinboard. Whatever action they choose to take, you can benefit by getting more traffic to your blog and your website. Let’s have a look at six tips to use Pinterest in the most effective way. A stunning profile draws in visitors. Create a great profile image and add engaging cover images for all your pinboards. Add a short description to your page that highlights your business. Don’t forget to verify the website that you have listed on your Pinterest profile. You can use boards to establish your brand and your authority in your field. Create a wide range of boards and give each board an interesting name and description to attract visitors. You can give information relevant to your product that would be useful to other pinners. Pinterest boards are great tools for creating brand awareness for your business. Take time to learn more about the tools that Pinterest offers to market your products, make your boards funny and interesting, analyze your growth, gauge your influence and more. It will help to know where you perform well and where there’s room for improvement. Using product pins will get you more clicks and give your brand higher visibility. A pin should include relevant information such as price, availability of stock and where to buy. One of the best ways to engage your visitors and invite more attention to your pins is to run a contest. A properly organized and executed contest has never failed to produce results. 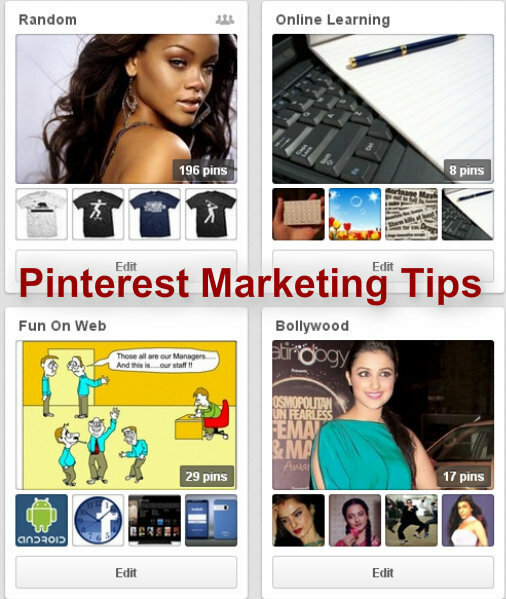 To boost your image once you are registered with Pinterest, use the apps available to run an interesting contest. Contests create engagement with people and gets them to interact with you more. Your pins reflect your business and a great pin will build your credibility and improve your visibility. A great pin should have most of the following features. A great image, compelling description, educative message, interesting offer and a suggestion of something more to follow. You should pin at least once a day to ensure your followers receive fresh content every day. Ensure that your pins are inspirational and related to your business. Do some repins, which can bring in referrals. Make sure that your pins look great in feeds as most of the people will be looking at the feeds. The more creative you get the better you are rewarded using Pinterest. Make the best use of the tools available to express yourself. A perfect pin attracts many people and receives many repins. Take time to identify what works best with your audience and look around to see how your competitors fare. Author Bio – Zane Schwarzlose is an SEO at Fahrenheit Marketing, an Austin SEO agency. Zane thinks that Pinterest is a lot of fun. yes pinterest alone can generate a lot of traffic and leads for business if you are a regular user on pinterest with thousands of regular pinner . Hope next article you will write about how to get thousands of followers on pinterest. Good job. Thanks for sharing this informative article.